There comes a time in every individual’s life when he feels totally and utterly alone. This loneliness does not have to be only physical, you could be surrounded by people, but still find yourself without anyone to turn to for support. Each and every one of us has been through this phase in life and when we see someone on screen who is in the same position, we certainly don’t expect them to break into an angry jig or scream and shout. On the contrary, to maintain the reality of the film, the actor has to get under the skin of his character and feel his pain and misery. At such a time, nothing is better than a song in the background that opens the floodgates of the protagonist’s emotions. There are umpteen films in which characters go through very low periods in their lives and at such a time, they turn to a singer to make the scene work. Special care needs to be taken because the singer needs to feel the same anguish and communicate the grief of the character for the actor. Who better than an actor to do this? Yes, the best person to pull off this genre of songs is none other than the late Kishore Kumar. In his vast career as a playback singer, he has sung a record number of masterpieces that communicate the pain of the character to the viewers and listeners and force them to empathize with him. The song “teri duniya se hoke majboor chalaa…main bahut door chalaa…” from the film Pavitra Paapi is one of the most meaningful and thought provoking song s from this block-buster. The lead character, played by Ajay Sahni, is a scrupulous con man whose conscience is practically dead, but rises like a phoenix when he sees the devastation caused by his mistakes. He tries to set them right and in the process, falls for an innocent girl from the very family he has ruined. When his true profession is revealed to them, they turn their faces away from him, including his lady love. At this time, the young man’s heart bleeds. No one could have better portrayed his heart break and dilemma except Kishore Kumar who sang the above mentioned song. With Prem Dawan’s lyrics along with heart rending music him for company, Kishore Kumar sings beautifully about the regret and hurt that fill the protagonist’s heart. The whole song moves the listener with the honest apologies in the thief’s heart and makes them share his heart ache. 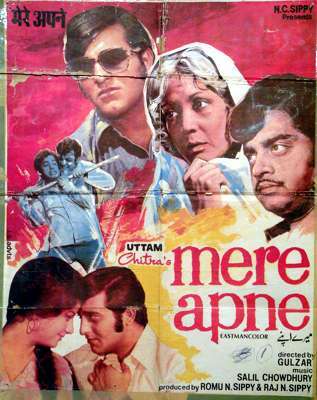 Speaking of regret, how can one forget to mention about the song “Koi Hoto Jisko Apna…” from the film Mere Apne? The story is about a man who finds himself up against those he loved and trusted all along. Vinod Khanna plays a man who is not interested in studies and is constantly rebuked by his rich father for being no good. His only passion is a girl who lives in the same locality. But things go horribly wrong when he falls out with his best friend, who also loves the same girl. Desperate circumstances lead to him losing everything-his friend, his father and his love; he is reduced to living on the streets in penury. As time flies by, he comes face to face with his former love, only to see her married to someone else. Thinking of better times, he reminisces about what he had envisioned and feels utterly and totally alone. In such a situation, Kishore da lends his magical voice to the unlucky character and sings beautifully about the loss that eats away at the young man’s soul. A beautiful creation by Gulzar Saab and Salil Chowdhury. Kishore Kumar did not only specialize in broken hearts scenarios-he was a man of different shades, a chameleon who could easily slip into any mood and do complete justice to the project at hand. Another wonderful song by the music maestro is “kaise kahe hum pyar ne humko…” from the film Sharmilee. 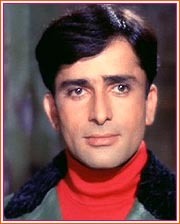 Shashi Kapoor is an Army Officer and like all well to do men in those times, went to see a girl to marry. He meets Rakhee and is falls for her immediately. However Rakhee gets into a bad company and runs away from her house on the eve of her wedding. To escape from social ridicule, her parents force her twin sister, who is completely polar to her in personality, to pretend to be her. At first Shashi Kapoor is clueless about this switch but when realization dawns, all hell breaks loose and he feels cheated and violated. He sings this song to vent the outrage in his heart and the lyrics given by Neeraj are completely in sync with S.D. Burman’s music and Kishore Kumar’s splendid voice to paint a very emotional picture. Something closer home is from the movie Anurodh. 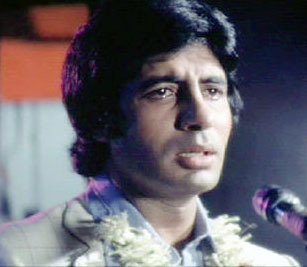 Rajesh khanna, the protagonist, is a singer by profession owes it all to his close friend Vinod Mehra. He falls in love with Simple Kapadia who is a very rich girl. She does not like Rajesh to keep company of Vinod Mehra, who is suffering from a terminal disease. While he is breathing his last, he requests his friend to sing a song. The traumatized singer can hardly get himself to sing unfalteringly and bring tears to the eyes of the audience with the song “jab dard nahi tha seene mein…” Kishore Kumar gives one of the best works of his career here and brings out the pain in his voice. A beautiful tear jerker from the master himself from a fine album scored by the duo Laxmikant Pyarelal. Another mind-blowing performance was in Muqqadar Ka Sikandar. Amitabh Bachchan works as a helper in Rakhee’s house and gets close to her during his childhood. However, her father is not happy of the closeness and decides to go away. The boy comes to town and is raised by Nirupa Roy. As a young man, he befriends Vinod Khanna who also loves Rakhee. Rakhee does not recognize Amitabh when they meet after many years. She does not approve of his mannerisms and dislikes him. During a function, Rakhee requests him to sing a song and now he chooses to reveal his identity to her by singing the song “o saathi re…”- a song from their childhood. The emotions that he goes through are very important as he is finally letting the tough exterior drop and is putting himself in a vulnerable position. Kishore Kumar does extremely well as his voice in the song and helps Amitabh put these emotions into a power packed performance. Even though Kishore da is no longer amongst us, we will never forget him for he was the voice for those who could not speak-for some actors as well as some of us. This entry was posted on Thursday, June 28th, 2007 at 2:48 pm	and is filed under Kishore diary. You can follow any responses to this entry through the RSS 2.0 feed. You can skip to the end and leave a response. Pinging is currently not allowed. Kishoreda was really the king of sad songs,the way he expressed painful emotions were awesome.That’s why Kishore Kumar is the greatest of all times.His songs are immortal. Whenever I listen to guruji’s sad songs,I feel emotional too.Boss ka jawaab nahin. KK’s sad songs are all truely marvelous, perhaps in every eras. Great write up. Good selection of songs for the theme. Really Kishoreda mastered not only the sad songs,but each and every mood of songs.He is the greatest genius of all times. Thank you. I downloaded the photos, sometime it’s great to read all these. kishore kumar…………………. its not a name, one person……….its like the superpower for me………….i love his voice so much tht he runs in my blood with passion and love…………..for me………..he is the only one………..the best singer ever…….the best tonal quality………i even love his silence………. « Bappi Lahiri – Kishore Kumar:A special bond.